Because of the upcoming exhibit a reporter came by today. I spent the morning clearing off the bookcase and dining room table; then I propped up some of my new work. I put Larry Jr., my IROBOT vacuum cleaner, to work on the floor and went upstairs to get ready. It was a nice interview with photos. Before I changed clothes and went into the workshop I thought--as long as I was spiffed up--I would set the camera on timer and take some photos. Here's the depressing part--I don't look any better than when I'm wearing my Good Will denim shirts! I believe MFK Fisher said we have to get beyond vanity; sometimes there is no choice. 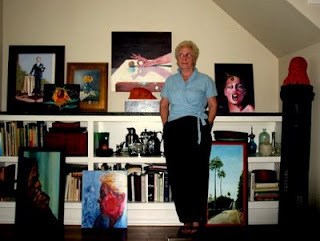 I enjoy painting self-portraits showing age; seeing it in photographs is a different story. Yesterday, I bid farewell to my arms--only kept three, one of each color. My grandchildren weren't allowed to play with guns; now they're almost teenagers. 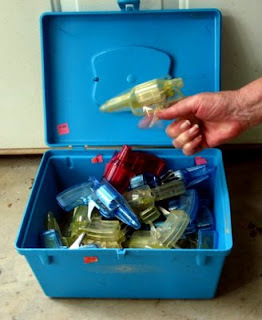 When a small hardware store went out of business and sold these for ten cents each--I bought them all. More is always better. As a child I loved playing with cap guns, arrows, knives, and bb rifles; I haven't hurt an animal or human yet. I should have avoided those candy cigarettes! I hope the previous Administration was not looking for these Weapons of Spark Destruction. 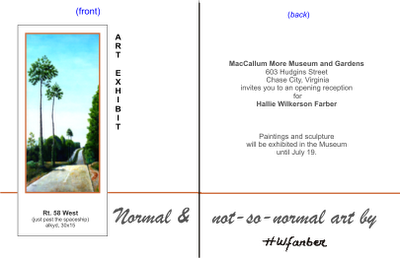 Next week's exhibit will include "selected sculptures." People ask why I switched from sculpture to painting; I thought it was a natural progression. Now I know the real answer--pedestals. These six pedestals were built of masonite 35 years ago; they stack like Russian dolls, and I remember picking up the stack and putting it into my Plymouth Fury Station Wagon. Then it was off to shows. Now each one seems to weigh about a ton. It took three days to get them from the workshop onto the porch for painting--Monday to clear the way to the pedestals and move them away from the wall; Tuesday's attempt to lift the top one off the stack (forget that); and Wednesday--I lay the stack on its side, pulled the smallest one out first and carried them one-by-one to the porch. They've been washed. Kneeling into position behind the pedestal before the camera's timer went off was not an easy feat--I needed eight shots. Today I painted them; everything hurts--tomorrow I buy a hand cart. You never know when chunks of marble might come in handy. While taking a break from pruning, I noticed the sun and shadows on my gloves and on the last camellia of the season. That was the end of my gardening and the beginning of art time. The chunk of marble was a perfect base; a tombstone carver had allowed me to look through his scraps (a habit from my sculpting days). 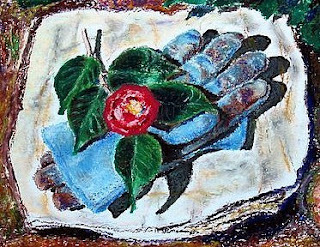 I found three pieces; they have been used to level the grill, to keep the crawl-space door closed, and one piece is now in a painting--The Last Camellia, oil pastel, 12x15. Auntie Oxidant, acrylic 20x16--I can't decide whether she's finished. One of the grapes might need a touch more color before she's ready for the exhibit. 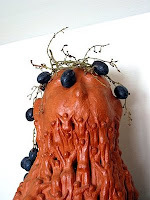 Luckily, I saved a photo of the grape-draped model--one of my sculptures from 1991 (The Return). I ate a lot of grapes for this painting. Today was the day--I had to varnish the Rt. 58 alkyd painting for the upcoming exhibit. In painting, I find two things nerve-wracking--signing my name and applying varnish. According to directions, varnish should be applied in a dust-free environment (ha). I placed a tarp on the floor of the porch and walked softly. It worked. I moved the painting into the workshop for the night. My fear now is that a tiny bug will fly into that blue sky and be trapped. Tomorrow--isolation coats and varnish for the acrylic paintings. Do other painters sweat through this? 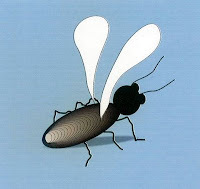 Don't recognize the bug above? It's a Buggs Island Wilkerdoptra! According to my sister-in-law, the spaceship is back in its rightful place--she drove to Danville today and saw it. There are three possible explanations for its disappearance: (a) There was an invisible shield around it on Tuesday when I drove to Danville, (b) I was so busy eating potato chips I missed it, or (c) It was in the shop for service. Two of my friends--one owns a local antique shop, the other is our UPS delivery person-- agreed that they had not seen the spaceship for several months! I will make the drive again and take my camera. Postscript: Friday, May 29. Here's a photo of the real thing--it's larger than I had thought. My art exhibit is less than two weeks away so I'm trying to get my ducks in a row--framing, varnishing, attaching wire to frames, and additional invitations need to go in the mail. My ducks always end up in piles--not rows. 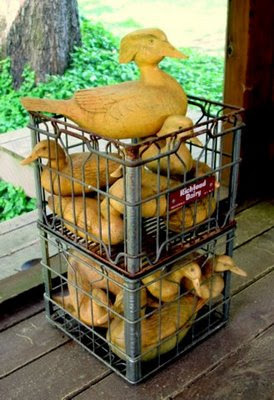 There were seventeen ducks at Good Will; how could I possiby choose just one? They all came home with me and I was tempted to put a "duck X ing" sign out front and have them march up from the street. I also considered making little goggles for them from innertubes (got some from a gas station) and let them waddle down to the lake. Neither came about. My husband spray-painted them yellow and they sometimes decorate the front porch for Easter--then it's back to their crates and into my workshop. A painting is planned: A crate of ducks sits protected under a dark red shed while a black bird bathes in a puddle--safety vs. freedom--rather sad. The painting is in the pile of stuff in my head; one day it will be on canvas--then the ducks can find another home. For ten years I have been driving West on Rt. 58 to Danville--a beautiful 50-mile trip. There are several tall pines that amaze me--when I pass the front yard with the aluminum spaceship, I look for the pines. I thought the painting of the pines was appropriate for an invitation to a local art exhibit. The title is Rt. 58 West (just past the spaceship). Today I drove to Danville with my camera; thought I should have a photo of the approximately six-feet-in-diameter orb. The spaceship is missing! I worried that the trees might disappear; I thought the spaceship was forever. My friends and I are saddened--it was a Southside Virginia Rt. 58 landmark. Ben Seibel's Impromptu dishes--delicate, footed white bowls, cups and saucers--are in a box. If Mom's wineglasses find a home (I tried to give them to my brother) the Seibel dishes will look nice in the glass-doored kitchen cabinet. If not, they'll go into the storage shed. 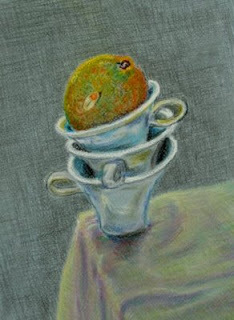 Three of the cups are in a drawing, On the Edge, 14x11; one of these days, they will appear in a painting. My brother and sister-in-law said they almost bought a doll for me in South Hill. Since I had looked for a used, slightly abused doll for several years without mentioning it to anyone, I got in the car and headed east to South Hill. For $5 I got my doll with clumpy, greenish hair. 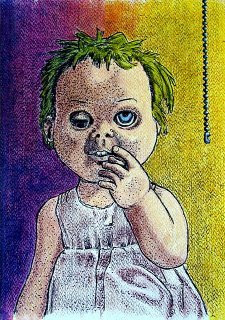 She has inspired three drawings--Pull the Chain, pencil & ink, 16x12, was the first and is my favorite. Browsing through the workshop for a vertical to add to the right side of the drawing, I spied a leftover pull chain--perfect--it provided a title. The doll will be moved from the workshop to the bedroom, but she'll be placed so she can't be seen from the bed. 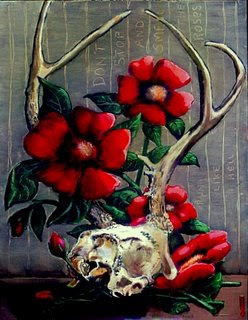 The deer skull was bought from a thrift shop. It livened up a boring flower painting and suggested the title: Don't Stop and Smell the Roses, Run like Hell, acrylic & oil pastel, 14x11. The skull will stay because I can't imagine anyone else giving it a home. 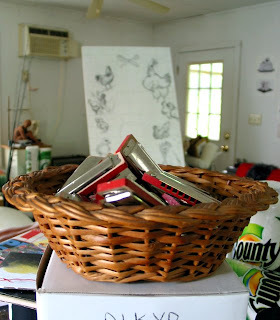 The items in the back of my car are off to the Ruritan Thrift Shop--wooden roses, dump trucks, a mixer, platters, and the basketful of harmonicas. When I left the shop, two young girls were making music with them. Nice. The globe, however, is still in my workshop. These tires are part of the playground at our local YMCA; a group of painters meet there on Thursdays. We pay $2, set up card tables, and work on whatever we'd like--mostly we laugh. 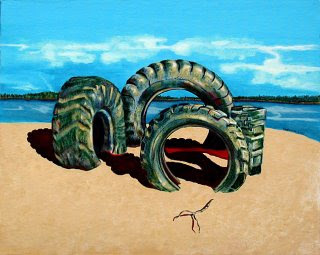 As I walked out one afternoon, I noticed the shadows and years of wear on the tires--I had found a subject--The Y, 24x30, acrylic on panel. (Obviously, recycling has been around for a while.) I took liberty with their location and pictured them on one of our sandy beaches. A new Y is being built--it would be nice if a concrete sculpture of these tires were installed out front. I like to tell my out-of-town guests about the harmonica-playing ghost. My plan--when I bought these--was to tell the story, then stand outside the guest house in the middle of the night and play the harmonica. I have never done it; I don't want to be the cause of heart attacks. As a child I loved playing with levels, T squares and plumb bobs. I found this level for $2 and left the tag attached--builder friends are envious. This level provided the title for the painting below. 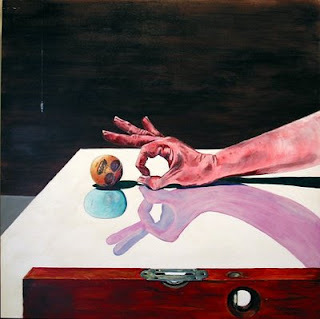 Leveling, 24x24 acrylic on Ampersand panel, was inspired by a contractor who, in 1999, took my money and didn't finish the job--art as anger management. When the painting was displayed locally I disguised him with sunglasses and dark hair. The level was not part of the initial concept for the painting--I used it to hold the painting in place when I viewed it from a distance. It grounded the painting and took it to a new level! It will definitely stay in the workshop. 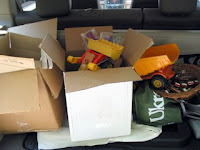 A small dump truck, a toy bulldozer, two stainless steel lamps, six plastic Hampton Inn platters, a bag of chopsticks, a bag of stainless knives, and lots of packing material are in the back of my car--ready for donation or dumping. I located my security staff. Two were in a box and one (with the gas mask) was in the corner of the bathroom on a pedestal pretending to be sculpture. I suspect they were partying during the cold months; their weapons will turn up sooner or later. 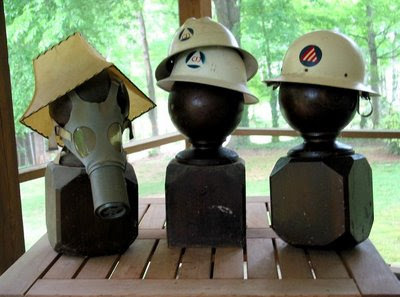 I will keep these newel posts and their helmets--great models. 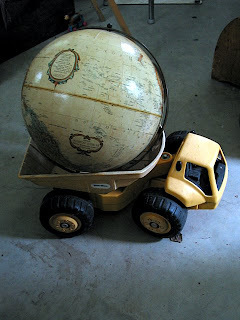 World in a Dump Truck is not a political statement but what I found in my workshop. 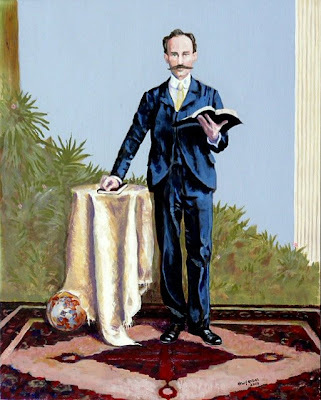 I've used the globe in one painting, The Preacher in 1905 (20x16 acrylic on Ampersand panel), shown below. The original b&w photo of the preacher--who shared my family's last name--was in a box of photos at Good Will. I felt he deserved better. Although globes are useful in Feng Sui, I think I will pass it on. The dump truck, however, will be used in a still life painting--I imagine it filled with vegetables or fruit. The title photo of Clarksville VA was taken from the Tisdale Bridge on the day of its dedication--June 8, 2005. It is actually two photos taken by Pam Speed; I stitched them together using Corel Photo/Paint. Pam and Brian "Stork" Seal are a young couple and former neighbors. They have since moved to Roanoke--an exciting VA city where they attend festivities like "70's Cocktail Crawls" and are arting around at the new Taubman Museum (http://www.taubmanmuseum.org/). 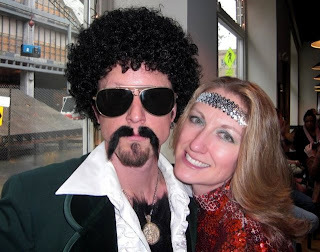 During the seventies, I saw costumes like these only on 14th Street in downtown Washington D.C. In the suburbs we were a bit more subdued. Our dog, Willie, found something interesting in the front yard, which is surrounded by a picket fence. It was a nice turtle and he was headed west. I moved him to the back yard--close to the dock and set him down facing west--thought he might sense the water and go for a swim. Now I wonder if he had spent hours crawling from the back yard to the front, only to have me put him back where he started. 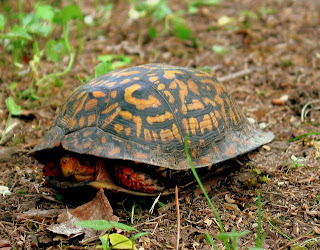 Turtles remind my of my father who, when he saw one crossing the road, always stopped the car and carried the turtle to the other side.